Anchorage had transitioned into full-blown spring breakup by the time Beat and I reunited on Sunday. Snow was disappearing from the mountains, sun blazed in the sky, and temperatures climbed into the low 50s. I wheeled my loaded bike with its clicking studded tires through the Anchorage airport (Ravn airlines let me put it on the plane in tact!) and found Beat in a hulking rental truck. It was an anticlimactic setting after two years of greeting Beat in Nome, but we shared a long hug that was every bit as satisfying. Times of loss have a way of expanding perspective, and Beat and Steve shared open and honest conversations as they made their way back to Anchorage. In turn, Beat and I openly addressed our relationship, joys we experience, values we share, and hopes for a future for which there are no guarantees. I recalled that adage that life is what happens while you are making other plans. All of our journeys were cut short, but we arrived at a more cathartic and meaningful destination. In Anchorage, our friends Dan and Amy where there for us, supplying cookies and tender sympathy as we processed the events of the past few days and recovered our battered muscles and diminished strength. Beat's and my annual sojourns in Alaska would be a lot more logistically difficult and a lot less enjoyable without a network of friends across the state, and their generous hospitality and kindness. Dan and Amy's house in Anchorage has been our Alaska "base camp" every year since we raced the Susitna 100 together in 2011. We're most indebted to them for everything they've done for us, and it was rewarding to spend a few unplanned days with them during this time. Here's Dan the professional adventure photographer, doing what he does best. 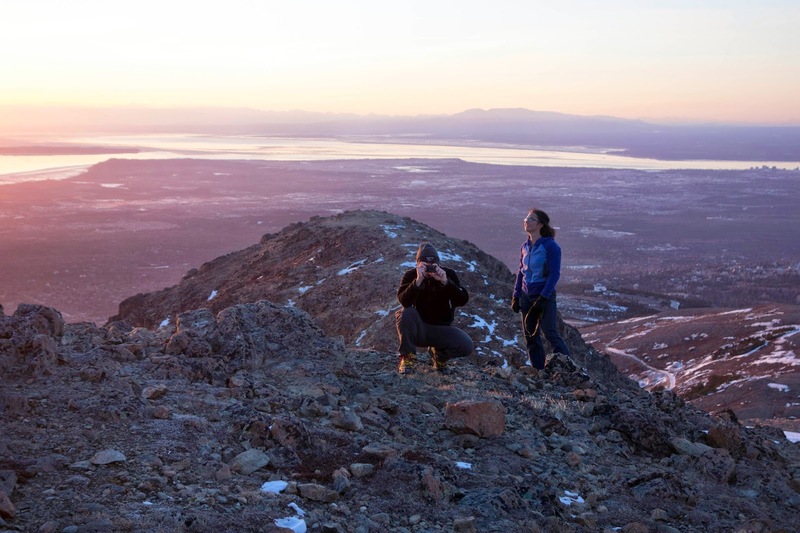 The four of us went for a "hike" on Flattop Mountain that was really more of a sunset photo safari and goof-off outing. 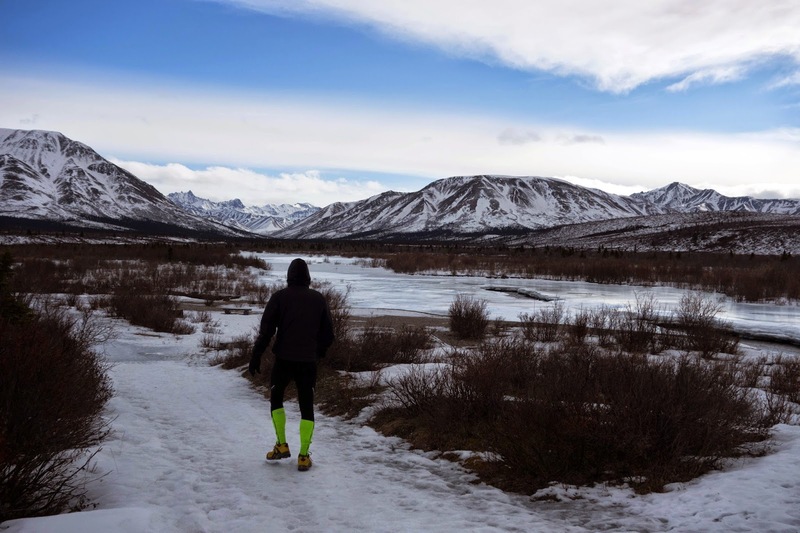 I'd embarked on two short and yet disconcertingly difficult runs since I returned from Unalakleet, and this was Beat's first venture outside since Koyukuk. Molten lava-like mud oozed down the mountain as we traipsed through slush and crossed bulletproof crust. 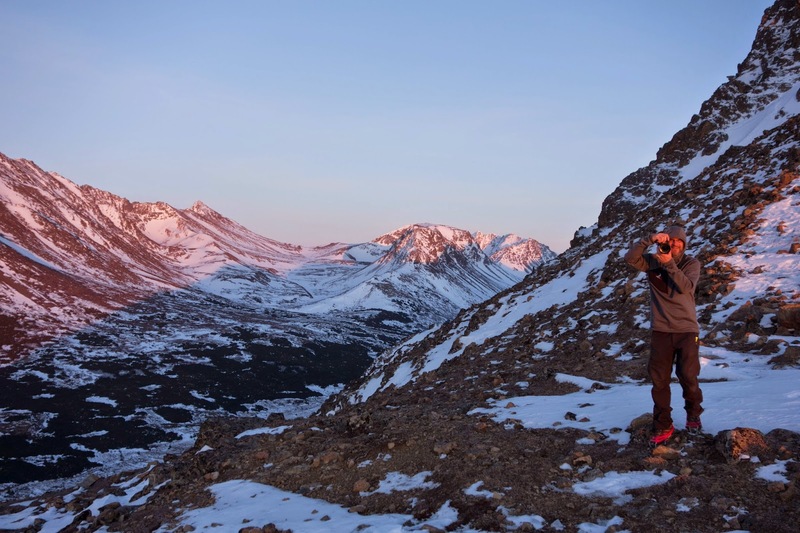 When I lived in Anchorage for a short time in the spring of 2010, this is how I remember hiking conditions in late May. 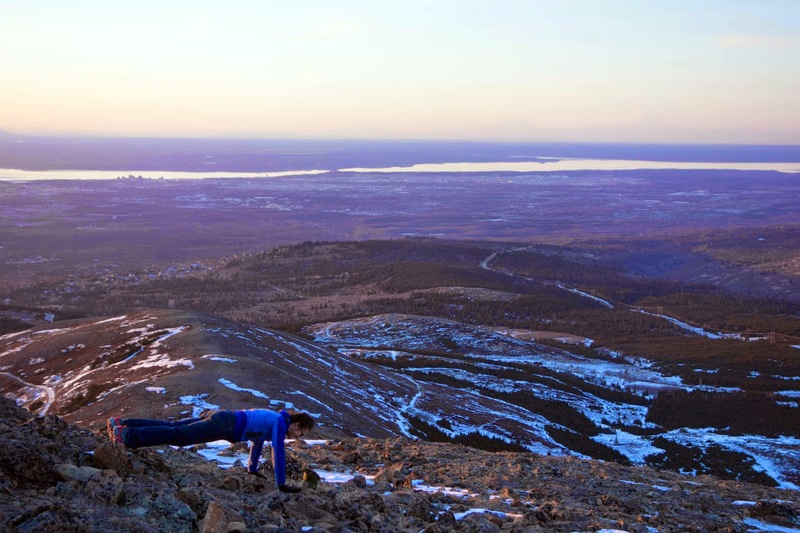 Here, Amy shows me one technique for building strength for future fat bike endeavors — elevated pushups while hiking. Amy can do these one-handed; I look to her as my muscle-building mentor. By incorporating some of these exercises amid my running and biking outings, I may be able to trick myself into more strength sessions. I also genuinely believe it's time for me to start looking for a gym that might have a reasonable membership to attend 2-3 times a week for weight training. The yoga mat and barbells at home just aren't working for me. I tend to come up with any excuse to avoid them. Although I'm not proud of this, I could use some accountability. After my Shaktoolik adventure, my own upper body was wrecked. My biceps gave out before I could even achieve one pushup (I can usually do more than zero! ), my forearms were slightly tingly, the muscles in my hands were stiff and slow to respond, and my shoulders and lower back were quite sore. On top of that, I'd tried two runs that were 90 minutes or less, at a slow (untimed) pace, that still felt like they were overtaxing my leg muscles and exhausted cardiovascular system. Amid these unsettling physical assessments, I received an official invitation to the White Mountains 100. 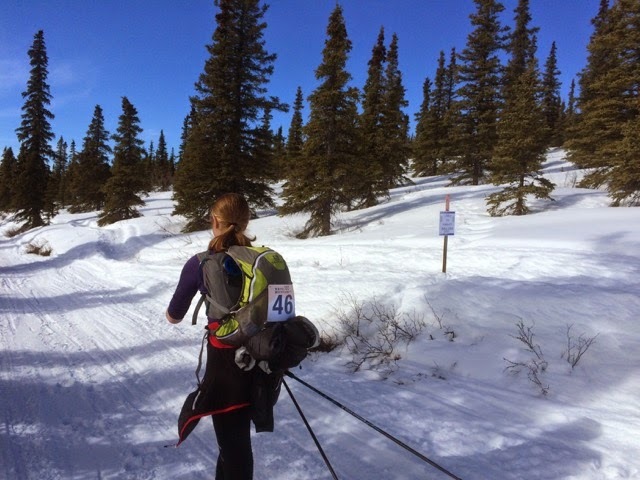 After four months of languishing on the wait list, my name had finally risen to the top and I had to decide whether or not I actually wanted to take on the challenge of a hundred-mile run on snow in the remote and hilly White Mountains. I gleefully accepted. After wavering on whether to return to California early, Beat decided to keep our original April 1 flight home and join me in Fairbanks. The White Mountains 100 RD, who is a friend of ours, gave Beat the okay to quietly tour the course self-supported, as long as he provided for all of his own food and water, did not bother any of the checkpoint volunteers, and gave no assistance to me at any time. Running a hundred miles self-supported is much harder than running a race, and Beat was still recovering from a journey that was longer and exponentially more arduous than my own. Still, he seemed enthusiastic about this idea. Traveling to Fairbanks together also gave me an opportunity to show Beat one of my (many) favorite places in Alaska, Denali National Park. 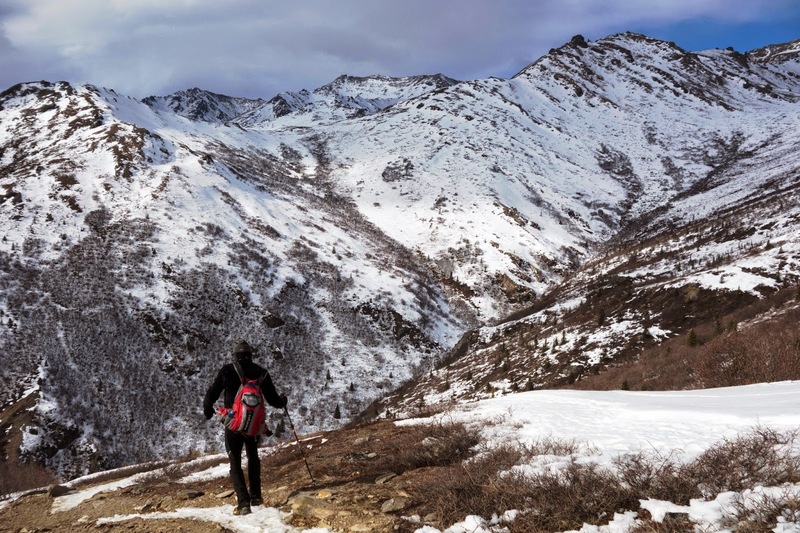 Although winter conditions and a few short hours to spare only afford ventures on the closest trails of the front country, Denali is still an incredibly beautiful and wild place. After visiting Dave Johnston in Willow and exchanging trail stories, we made our way north for a hike to the Mount Healy overlook. 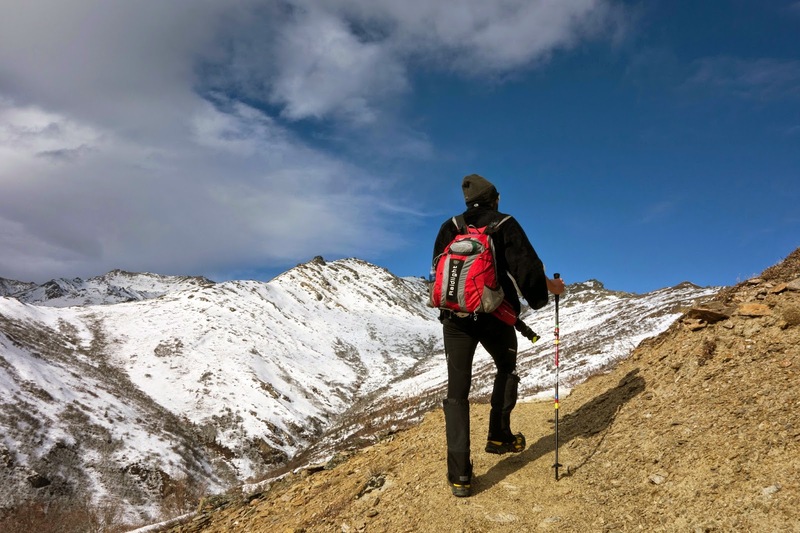 This hike is 5.5 miles round-trip with about 2,000 feet of elevation gain, and trail conditions were alternately slushy and muddy. It was again the most difficult thing either of us had tried since we returned from the Iditarod Trail, and we were both dragging. All of my hiking gear, including my trail-running shoes, were still in a box that I'd mailed to Nome. By hiking in my over-large bike boots with only a single pair of socks (because it was so warm), I managed to develop a quarter-sized blister on my right heel, just two days before the White Mountains 100. Argh! After Mount Healy, we drove into the park to the end of the winter-maintained road and went for a short walk along the Savage River. We spent Thursday evening with two Iditarod volunteers who I met on my flight from Unalakleet to Anchorage. I'd actually first met Kate last year at the White Mountains 100; she also finished the race on a bike. We'd exchanged a few messages since, but it was a surprise to see her at the Unalakleet airport after she and her partner spent a week volunteering for the Elim checkpoint. Kate has led a fascinating life — originally from New Zealand, spent several seasons working in Antarctica, including one winter at the South Pole (115 below! 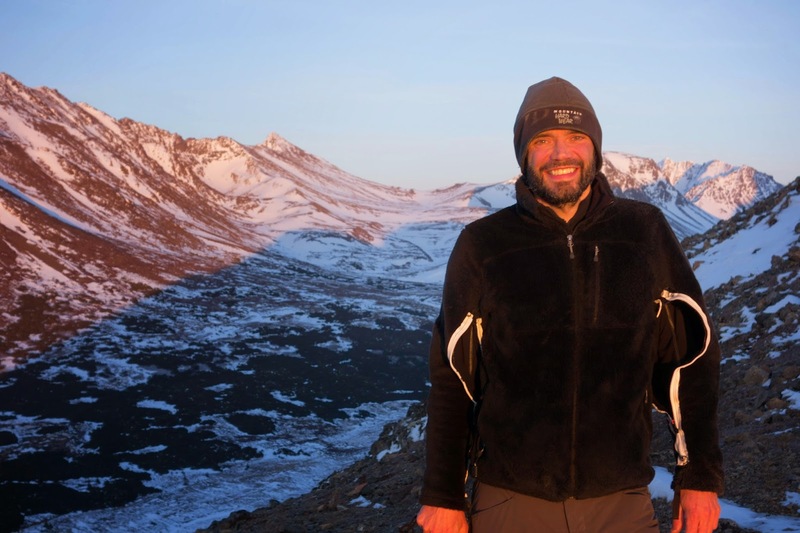 ), moved to Alaska, finally achieved legal residency through the marriage equality act, and lives and works in a small community amid the expansive Alaska Range. 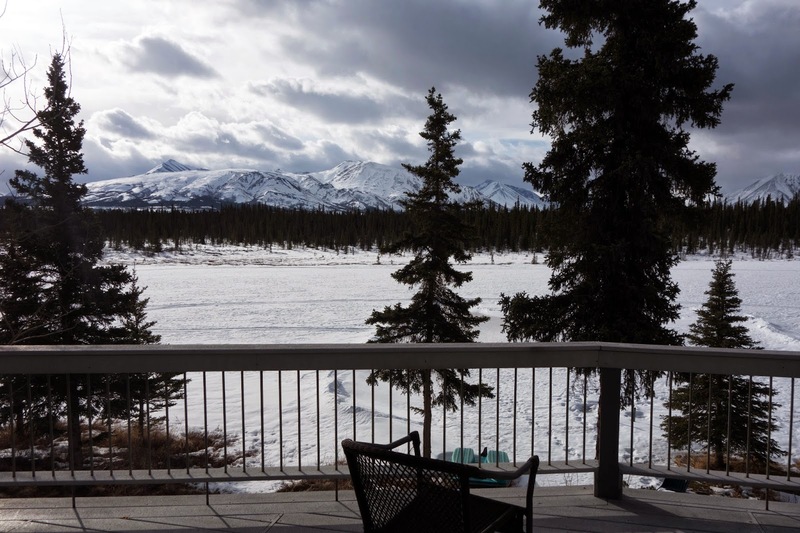 She and her partner were house-sitting at a lodge on Tonglen Lake for the winter, and this was the view from their back porch. Not bad! One thing I couldn't borrow was shoes. My pair of Montrail Mountain Masochist Outdry shoes were getting on in years, and the waterproof version of this model isn't made any more. Icy spring conditions and reports of frequent overflow prompted a desire for carbide studs. As we drove into Fairbanks, Beat and I stopped at Goldstream Sports. After jogging around the parking lot in a couple of different models and getting helpful recommendations from a Fairbanks runner, I settled a pair of Salomon Spikecross 3, men's size 9 (women's 10.) They had large lugs that seemed great for soft snow conditions, nine carbide studs in each shoe, and a water-resistant "Clima-Shield" outer. Embarking on a 100-mile run in brand new shoes, in a model and brand I've never even tried? (This is my first pair of Salomon shoes.) Why not? 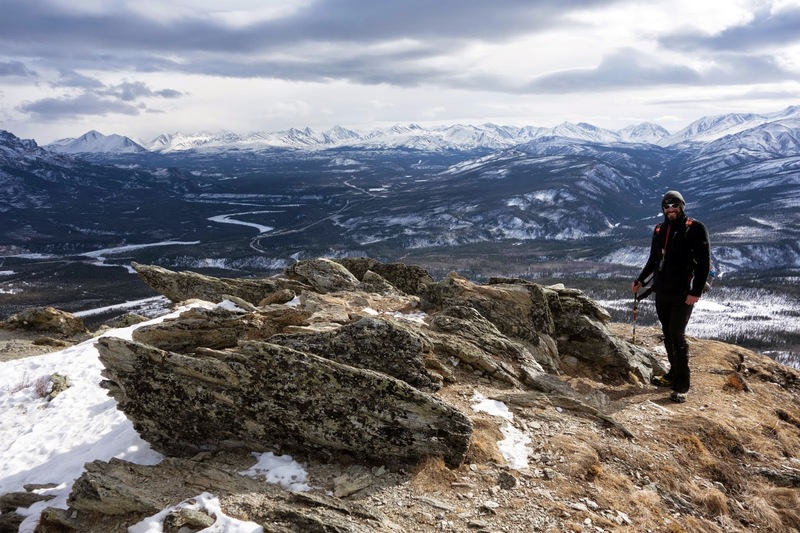 Goldstream Sports was also having a 50-percent-off sale on backpacks, among them the Salomon Agile 12. I'd already decided that I wanted to avoid dragging a sled in the White Mountains 100. This pack was a fair amount smaller than the one I'd planned to use in the race (a 25-liter pack), but with the warmish forecast and perhaps a little streamlining of my food and supplies, I thought I could make this 12-liter pack work. 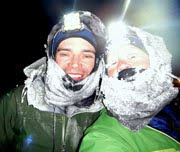 I still planned to pack 5,000 calories of trail food, two liters of water in a separate vest, a pair of Wiggy's Waders (one BLM ranger perpetuated a lot of gloom and doom regarding "knee-deep overflow"), a large puffy jacket, primaloft shorts and knee warmers, extra socks, vapor barrier socks (in case I got my shoes wet), extra balaclava, neck warmer, extra gloves, mitten shells, small medical kit, fire starters, space blanket, two headlamps, camera, Delmore tracker, and Garmin eTrex. I decided to leave the borrowed snowshoes behind. It was going to be a tight fit, but felt reasonably comfortable and, after dragging Snoots around on the Bering Sea coast, unbelievably light. I was so excited for the race! ooh...."Embarking on a 100-mile run in brand new shoes, in a model and brand I've never even tried? (This is my first pair of Salomon shoes.) Why not?" Sure....what could POSSIBLY go wrong? Jill...pretty much my FIRST rule of hiking is to NEVER bring a brand new set of shoes/boots on a trip, as it almost ALWAYS results in horrific blisters. I pray you don't end up that way...but it bodes bad in my book. Not much more important that your feet (and knees) on any outdoors event.